The No. 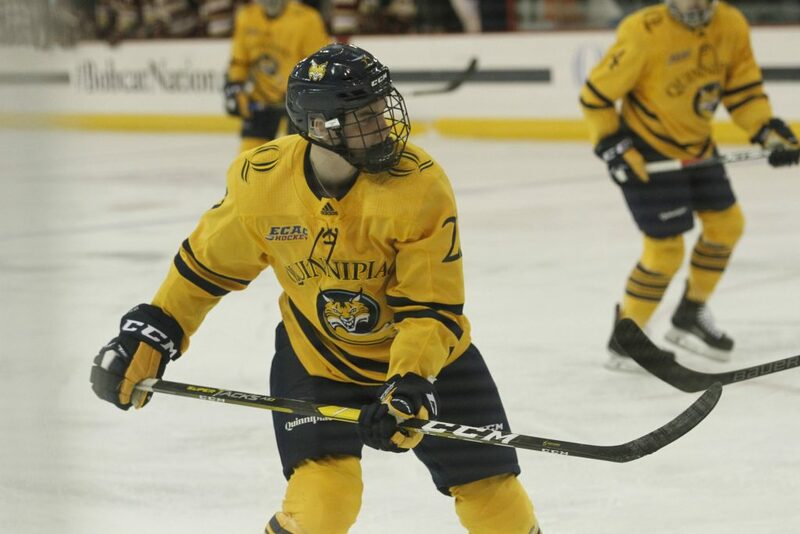 13 Quinnipiac Bobcats (6-1-0, 1-1-0 ECAC Hockey) will host the Rensselaer Polytechnic Institute Engineers (3-4-0, 3-1-0 ECAC Hockey) on Friday at 7 p.m. in Hamden. The Bobcats are back home after splitting their first weekend of ECAC Hockey play at Harvard and Dartmouth. It was a tale of two cities for Quinnipiac as it took care of Harvard 5-3 with a flurry of second period goals in Cambridge, but was unable to duplicate its efforts and was overwhelmed by Dartmouth and took its first loss of the season, 5-1, in Hanover. The Engineers enter Hamden coming off a split series of their own as they were defeated 6-0 by the Clarkson Golden Knights on Friday, but rebounded with a 3-2 win over St. Lawrence on Saturday night. The senior captain from Pembroke Pines, Florida has been on an absolute tear for Quinnipiac this season. Priskie leads the Bobcats with 6 goals in 7 games and is second on the team in points (9) and shots (25). His 28 career goals are tied for most by a defenseman in Division I program history and he’s currently just 14 points away from hitting the 100-career point mark. Priskie not only leads the Bobcats on the ice, but also off the ice as he was one of 15 NCAA Men’s Hockey student-athletes nominated for the Senior C.L.A.S.S. Award which recognizes seniors with notable accomplishments in four categories: community, classroom, character, and competition. Priskie is without a doubt someone the Engineers will be keeping an eye on. After leading the Engineers last season with 12 goals and 11 assists, Hayhurst is off to hot start in 2018 with a goal and 10 assists for 11 points in 7 games this season. The junior forward has eclipsed the 20-point mark in each of his first two seasons in Troy and looks primed to do so again. The Quinnipiac defense will certainly have to contain Hayhurst in order to slow down this Engineers offense. The Bobcats have found success in fast starts this season as they are undefeated when scoring first. Head coach Rand Pecknold has preached the importance of his team playing to their identity and re-establishing a strong culture and being ready from the drop of the puck is a huge part of that. An early goal could be crucial to the Bobcats earning two important points in conference play Friday. The Engineers have jumped out to a solid start in conference play this season and that success can be attributed to them pressuring their opponents. On the flip side, Quinnipiac’s success had been mostly due to their ability to limit team’s shots and keep pucks away from Keith Petruzzelli. If the Engineers can figure out a way to make Petruzzelli uncomfortable in his own net and pressure him with shots, they could be well on their way to a victory.